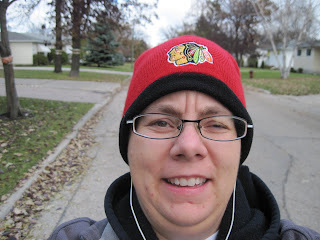 The kids were away preparing for trick or treating so I decided to go for a nice walk on the aft of Halloween. The sun kept trying to peek out and I wanted to take advantage if it did. With my iPod on and my pedometer set, I was ready! Here I am just starting out! I did say the sun was trying to peek out didn't I? Well, really it never did and in fact, it even started to snow during my jaunt. Not enough to make it unpleasant but after 2 almost solid weeks of cloud, the sun would have been nice. 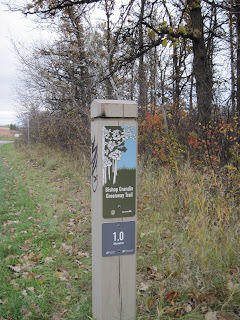 I was heading toward St Vital Park which is a nearby park to my house and one I've spent a lot of time in during my life. As a kid playing in the big tunnels which are no longer there, as a teenager skipping math class after visiting Clancy's for a drink or two...(sorry Mr Pederson) and now as a Mom with my own kids watching my daughter do cross country races and playing with them at the new play structure equipment! 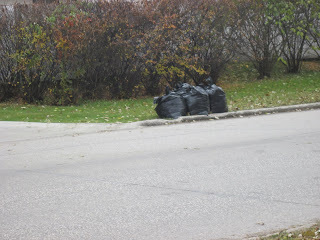 This is a house across the street from the entrance to St Vital Park and I'd bet money these bags are filled with leaves. Leaves that could so very easily be taken to the Leave it with us dropoff area inside the park, less than a kilometre away. Sure, they'll decompose at the dump but really, put a little effort in and take them to the park and don't give me excuses why you can't. We do and its such a little thing. 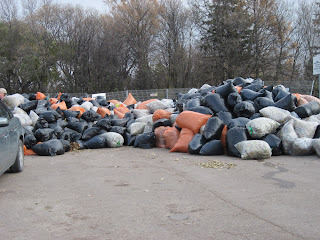 Note the large number of bags of leaves that *have* been dropped off at the Leave it with Us site. I won't say anymore. Really, I won't. 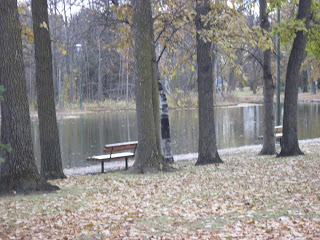 And while I love St Vital Park, I must admit, the scenery is just not quite as nice in the fall as it is in the summer when there is green galore. +11 on Friday (+11 in November?? Oh my, who can believe it? ), they must be getting ready to fly south soon! After leaving the park, I headed south up to the Bishop Grandin Greenway portion that extends from River Road up to St Mary's. There were a few people sharing the walkway with me but not too many! I'm so thrilled that they finally got this portion of the walkway in and am only sorry that I don't get to use it more often and take advantage of it. Great feature and someday I'd like to walk the whole portion of it! The weather never really improved but I was hot when I returned home to discover that I'd walked 5 kms in total in one hour and 15mins! I should mention that I did a few running jags too but those weren't too long. I need to work up to that! Join us for the month long Annivesary challenge!